The eulogies for the recently deceased John McCain, a US Senator for Arizona, have been plentiful, and so far as the American mainstream media is concerned, they have verged on the hagiographic. He has been variously described as a “patriot”, a “war hero” and a “defender of freedom”. Most perplexingly, McCain was lauded as a “warrior for peace”. But while praise for McCain has been dutifully administered in reverential terms by both liberal and conservative figures, the truth is that there is widespread dissent about McCain’s legacy as a man, as a military officer, as well as a politician. Perhaps, most worrisome is the construction of McCain’s legacy as one of the resolutely principled maverick and insatiable peaceseeker. On the contrary, McCain operated at the highest echelons of the American Establishment, a closeted world of vested interests comprising a network geared towards the enrichment of the American elite. He was a captive of the defence industry and an unceasingly aggressive spokesperson for the post-Cold War era militarism that has compromised the United States and brought it down low in the eyes of the global community of nations. So why the almost uncritical eulogising of a controversial life beset by allegations of incompetence, corruption and disloyalty? Perhaps it is the tradition of the people of the United States to venerate their warriors. From the highest serving general to the lowest level footsoldier, Americans have a penchant for what might be termed ‘soldier worship’. There is also a tendency for disparate groups of people to pull together behind someone when confronted by an idea or by a person to whom they feel repugnance. It is certainly the case that the transition from life to death brings out the sentimental in people whether such death is sudden or prolonged. And, of course, as with most cultures, Americans are cautious about speaking ill of the dead. Each of these have doubtlessly played a part in the positive reviews of the life of John McCain since his passing. John Sidney McCain III was born into a family of naval servicemen, two of who reached the rank of admiral. He served as a naval aviator during the Vietnam War and later retired as a captain. 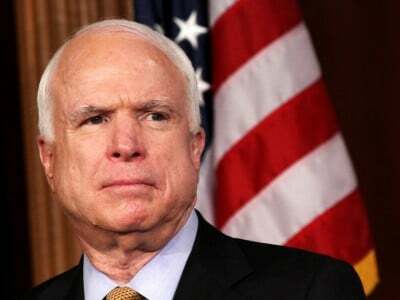 McCain also engaged in a well-publicised, long-running feud with Donald Trump who as a polarising figure has succeeded in arraigning different strands of his countrymen against his presidency. His demise, caused by the effects of a malignant brain tumour, was a cruel one. Glioblastoma is the most aggressive form of cancer. But there is much to question about McCain. But the competence of the future senator as an aviator has been consistently questioned. For instance, in 1960 while on a training exercise, he crashed his plane into Corpus Christi Bay, in the process shearing the skin off its wings. The following year, while serving with an aircraft carrier in the Mediterranean theatre, he flew through electrical wires in southern Spain causing a power failure in the surrounding area. And in 1965, while en route to Philadelphia for the Army-Navy football game, he crashed a T-2 trainer jet in Virginia. These incidents, caused by a carefree attitude described as “cocky, occasionally cavalier and prone to testing limits”, led to rebukes by the naval authorities. They also explain a great deal about the allegations surrounding his responsibility for two more serious incidents. Sarcastically dubbed ‘Ace McCain’ by his commanders, McCain’s career as an aviator was, nonetheless, allowed to continue. Although the official inquiry into the catastrophic fire onboard the USS Forrestal in July 1967 was officially blamed on the accidental firing of a rocket caused by an electrical power surge during preparations for a strike against a target in North Vietnam, the claim that the disaster, which killed 134 sailors while injuring another 161, was caused by McCain ‘wet-starting’ his jet has refused to die. ‘Wet-starting’ refers to where pilots flood the combustion chamber of their craft with extra fuel before ignition in order to create either a loud bang or a plume of flame. McCain is claimed by some to have done this and that the ensuing concatenation of maladies are traceable to his reckless act. That he avoided the consequences of his actions is said to be due to the seniority and influence of his high-ranking father who some, including Admiral Thomas Moorer, a former Chief of Naval Operations and Chairman of the Joint Chiefs of Staff, allege was at the time cooperating with the coverup pertaining to the deliberate attack on the USS Liberty by the armed forces of the state of Israel, which had occurred the previous month. Three months later, McCain was shot down while conducting a bombing sortie over North Vietnam. No official blame has ever been attached to McCain for his shooting down. But as his aircraft was lost behind enemy lines, its remains were not subjected to the same sort of forensic analysis as had occurred after the earlier mishaps while in control of the cockpit. In all three incidents, McCain’s skill and judgment had been called into question. Aviators like McCain had been trained to stay at altitudes of 4,000 to 10,000 feet in environments where there were heavy deployments of surface-to-air missile launchers. They had equipment which warned the pilot that they were being tracked and also when a missile locked on them. These missiles were relatively easy to out-manoeuvre up to a point. This changed when there were multiple launches of between 6 and 12 missiles. McCain claimed in his autobiography that 22 missiles were fired at his squadron that day and that one blew off his right wing. He had been flying at an altitude of 3,000 feet above Hanoi. The United States military Code of Conduct prohibits prisoners of war from accepting parole or other favours from the enemy, although during the Vietnam War, latitude was generally given to those who were seriously ill or injured. McCain, who sustained two broken arms and a broken leg when ejecting from his plane, has been accused by some fellow veterans who were held at the same camps as he, as one who sold out his fellow prisoners and other servicemen by cooperating with his captors in order to be the beneficiary of a cushy captivity. His detractors accuse him of making broadcasts designed to infringe upon the morale of his fellow servicemen and of giving up military secrets such as that related to his flight, rescue ships and the order of attacks. And while they allow that McCain refused an offer of early repatriation unless all prisoners were released, some allege that he was given special treatment with two other ‘defectors’ for cooperating. In fact, they argue that McCain’s refusal was an easy one given that he knew that his future prospects in the military and any public office would have been ruined. Many veterans claimed that those who were granted early release in three sets of releases in 1968 were collaborators who they dubbed ‘the slipperies’, ‘the slimies’ and ‘sleazies’, and that McCain had acknowledged this. To be sure, several of McCain’s co-prisoners have spoken on his behalf over the years. Men like George Day and Orson Swindle confirm that torture was regularly administered and that they were forced to talk, although they attempted to mislead their captors by telling untruths. In McCain’s case, he claims his response to questions asking him about future bombing runs was simply to give those that had already taken place. He also claims to have given the names of the offensive line up of the Green Bay Packers football team as members of his squadron. Render Crayton, McCain’s co-prisoner for one year (1971-1972) at the camp referred to as the ‘Hanoi Hilton’, has often spoken up on behalf of McCain and claims that McCain “gave hell to his captors”. An example of this was deciding one morning to loudly sing the Pledge of Allegiance and the National Anthem. The penalty for this insubordination was to be removed from a “big room” to “smaller cell rooms”. This does not impress those veterans against McCain who assert that no one witnessed the series of tortures he claimed to have endured. In his autobiography, Faith of My Fathers, McCain admitted that he felt guilty throughout his captivity because he knew that he was being treated more leniently than his fellow POWs owing to the fact that he was the son of the commander-in-chief of all US forces in the Pacific region, including Vietnam. His captors referred to him as the ‘Crown Prince’. They also point to the tremendous lengths McCain went towards blocking the release of classified documents during the 1991-1993 Senate Committee hearings on Prisoners of War and those Missing in Action as evidence of his having a personal interest in suppressing information which would discredit him. Through McCain’s efforts, documents such as related to all the Pentagon debriefings of returned prisoners were classified by legislation. A ‘Truth Bill’, which had been twice introduced to ensure transparency over missing men was bitterly opposed by McCain who then sponsored a new bill which sought to create a bureaucratic maze ensuring that only a few non-descript documents could be released. It was passed into law. His rationale that the sealing of these files was for reasons of privacy and preventing the reviving of painful memories were not accepted by those who point to the fact that debriefings from returning Korean War prisoners of war are available to the public, and, as was the case with Korea, could have provided useful leads in so far as the fate of those who were missing in action in Vietnam, Laos and Cambodia. Those who opposed McCain were often subjected to vitriolic abuse by a man who developed a renowned temper. He referred to individuals and groups campaigning for information on MIAs as “hoaxers”, “charlatans” and “conspiracy theorists”. They retorted by dubbing him the ‘Manchurian Candidate’. In fact many of them along with the veterans against McCain often refer to his conduct while in captivity as having been nothing less than treachery. Claims that McCain was on a list of 33 American prisoners of war earmarked to be executed for treason cannot be corroborated. But possible retribution against him by hardline military officers was rendered impossible by the US Defense Department whose officials had adopted a general policy of “honour-and-forgive” for returning prisoners of war. One specific element of this policy was not to prosecute any prisoners of war for making pro-North Vietnamese propaganda statements while in captivity. And to back this up, a move in 1973 by an Air Force colonel charging seven enlisted men of collaborating with the enemy while they were held as prisoners of war by North Vietnam was dismissed by the secretaries of the Army and Navy for lack of evidence and the mitigating circumstances of the “long hardship” they endured while in captivity. While McCain is perceived by his detractors as having escaped punishment for his ‘disloyalty’ while in uniform, some point to his treatment of his first wife as evidence of his capacity for betrayal. A beautiful divorcee who he had married in 1965, Carol McCain had remained loyal to her husband during the period of his captivity. However, in 1969, she was badly injured in a motor accident and had to undergo numerous operations. She lost several inches in height and gained weight. McCain confessed that he returned home to a wife who appeared to be a different woman. He admitted to philandering and eventually divorced her to marry a woman who was 18 years younger than him. His critics make the case that McCain lost interest in spouse who was no longer the ‘trophy wife’ he had married and replaced her with an extremely attractive woman whose family were very wealthy and well-connected in the state of Arizona, where he would begin his political career. His critics cite this as evidence of McCain’s ruthless and calculating streak, which was guided neither by virtue nor by principle. As a politician, McCain has been lauded as having been guided by a code of “honour, courage, integrity and duty.” His maverick reputation is seen as evidence of his ability to eschew the narrow confines of partisan politics. But his tenure as a senator was beset by allegations of corrupt practices, of being a pork-barrel politico in the thrall of the military industry and Israel lobby, and of being a warmonger who supported America’s recent wars, which has led to the destruction of whole countries and of countless innocent casualties. As a new senator in the early 1990s, McCain was involved in a corruption scandal after he and four senators from the Democratic Party were accused of trying to intimidate regulators on behalf of a campaign donor who was eventually imprisoned for corrupt management practices. He escaped with a reprimand for having “exercised poor judgment”, but with the accompanying judgment that his actions “were not improper”. In August 2006, McCain was captured in a photograph going onboard a luxury yacht rented by the Italian con-man Raffaello Follieri in Montenegro. It was here that McCain met the Russian oligarch Oleg Deripaska for a second time, after their initial meeting in Davos. Both meetings had been arranged by Rick Davis, who like Paul Manafort has been a long-time conduit between American big shots and the Russian ultra-rich. Nathaniel Rothschild, who has large business interests in Montenegro, a country that granted him citizenship in 2013, also met with McCain. Events unfolded to reveal that McCain had been part of an elaborate scheme which enabled Western financiers to buy up Montenegro and bribe influential members of the country’s elite who would be pliable to the idea of prising Montenegro away from Serbia. The long-term goal was for Montenegro to declare its independence and pave the way for its accession to membership of the North Atlantic Treaty Organisation (NATO), an objective that came to fruition in 2017. McCain’s scheming in regard to Montenegro highlights his connections to the wealthy interests who control Western politicians, both of who work hand-in-hand in advancing Western geopolitical interests. The co-opting of Montenegro into the Western financial sphere and its membership of (NATO) were manoeuvres calculated to injure Russia’s commercial and military interests. First of all, the oil and gas explorations subsequently embarked upon in the outlying Adriatic Sea is designed to create a market which aims to undercut or totally nullify Russian ambitions to supply oil and gas to countries in the region via a South Stream pipeline project. Secondly, transforming its military status from one of neutrality to being part of the Atlantic Alliance is in keeping with NATO’s post-Cold War eastward expansion, a policy which is designed to intimidate Russia, and which is in defiance of the agreement reached at the end of the Cold War between the leaders of the West and the former Soviet Union, that Germany reunification was predicated on the condition that NATO would not expand eastwards. John McCain, by words and deeds, demonstrated his support for the anti-Russian sentiment that has permeated corridors of power in the United States since the coming to power of Vladimir Putin, a nationalist who brought to an end the mass plunder of Russia’s resources by Western interests during the government led by Boris Yeltsin. Indeed, no politician better embodied the twin doctrines that encapsulate the militarism pursued by the United States in the aftermath of the US-Soviet Cold War than McCain. These are philosophies espoused by Paul Wolfowitz and Zbigniew Brzezinski. The former provided that American policy was to ensure that after the fall of the Soviet Union, no other power should be permitted to rise and compete with the United States for global influence, while the latter was fixated on militarily intimidating Russia while seeking its dismemberment and relegation to a region designed to serve the energy needs of the West. His dismissal of Russia as a “gas station masquerading as a country” and his forthright comment that Montenegro’s accession to NATO was “vital for regional stability and the joint effort of the Western allies to resist a resurgent Russia”, provided clear evidence of his position. While Putin’s allegations were pooh-poohed by the White House as “patently false” and by the state department as “ludicrous”, events in Ukraine in 2014 clearly demonstrated McCain’s involvement in the American-sponsored overthrow of the elected government led by Viktor Yanukovytch. This was made possible by utilising the street muscle of ultranationalist groups such as Pravy Sektor. McCain was repeatedly photographed with Oleh Tyahnybok, the leader of the far right Svoboda Party which has been accused of being neo-Nazi in ideology while being vocally Russophobic and anti-Jewish. McCain, who wielded a great deal of power as a long-term senator, allegedly chaired an important CIA meeting in Cairo that was pivotal in fomenting the so-called Arab Spring. And just as he met with political extremists in Kiev prior to the US-backed coup, in 2011 he was seen walking the streets of Benghazi where he was photographed meeting anti-Gaddafi rebels who embraced the Islamist creed of al-Qaeda, the alleged perpetrators of the September 11th attacks on the United States. He called the rebels “heroic” and lobbied for US military intervention weeks before NATO began its bombardment and training of the al-Qaeda-affiliated Libyan Islamic Fighting Force (LIFG). And given his vocal support for overthrowing the government of Gaddafi and his ‘fact-finding’ tour, he was also likely to have been influential in paving the way for President Barack Obama’s decision to authorise the use of predator drones. McCain would later be pictured with Senators Lindsey Graham and Blumenthal giving an award to Abdel Hakim Belhaj, the leader of the now disbanded LIFG. The Libyan intervention, enabled by the United Nations resolution based on the ‘Responsibility to Protect’ doctrine, of course ended in human disaster. Gaddafi was toppled, but a nation which was once Africa’s most prosperous country soon degenerated into a failed state composed of warring militias, Islamist strongholds that have imposed rule by Sharia, and the establishment of slave markets composed of human chattel of Black African origin. The removal of Gaddafi which McCain cheered on has led to a deterioration of security beyond Libya as Islamist terror groups situated in the Maghreb (Al-Qaeda in the Islamic Maghreb) and further down in the Lake Chad Basin (Boko Haram) have been strengthened because of the availability of large quantities of arms and munitions previously owned by the fallen Libyan army. McCain’s dallying with extremists also extended to illegally entering into Syrian territory in 2013 and meeting with anti-government rebels who he described as “brave fighters who are risking their lives for freedom”, but who most neutral observers would classify as terrorists. McCain’s support respectively for the Iraq War which overthrew Saddam Hussein, the Western-backed insurgencies in Libya and Syria, NATO expansion and confrontation with nuclear-armed Russia clearly mark him out as a supporter of American militarism, a geopolitical policy that has caused tremendous harm to American prestige among the community of nations, caused hundreds of thousands of deaths, caused large-scale human displacement and a refugee crisis, and which has persistently kept NATO and Russia at loggerheads. It makes a mockery of Congressman John Lewis’s attempt to eulogise him as a “warrior for peace”. Indeed, it was no surprise that the arms giant Lockheed Martin, which has profited from the wars supported by McCain, issued a tribute after his death. That he sympathised with the neoconservative ideology and was beholden to the objectives of the Israel lobby is beyond doubt. His support for American interventions in the Arab world targeting secular governments perceived as not towing the line with Israel was apparent in his role in fomenting insurgencies in Libya and Syria, the latter in regard to which he unceasingly promoted a more direct form of US involvement. It is also confirmed by his long-term attitude of belligerence towards Iran, which he consistently denounced during his presidential campaign in 2008. While on the hustings, he notoriously broke out in song by substituting the lyrics of the Beach Boys hit Barbara Ann with “Bomb Iran”. His statements tended to indicate that he would have been in favour of attacking Iran at the behest of Israel and its US-based lobby groups, an action that was strongly resisted by Barack Obama. McCain, not surprisingly was dismissive of the Obama administration’s deal with Iran over its nuclear strategy, which he derisively referred to as a “feckless” approach to foreign policy. McCain was despite his maverick label an establishment man adept at manoeuvering between the public spotlight and the shadowy, largely unseen world of what many now understand to be the ‘Deep State’. He was almost certainly a key player in the machinations of America’s ‘double government’ and its formulation of national security policy which, as Professor Michael Glennon pointed out in a lengthy research paper, has essentially remained unchanged from successive administrations starting with George W. Bush, through to the one headed by Barack Obama, and now that of Donald Trump. Far from the mainstream narrative that he was a beloved figure, McCain has gone to his grave leaving a great number disgruntled for various reasons. For many veterans, he will forever be ‘Johnny Songbird’ of ‘Hanoi Hilton’ infamy; like his father, a man of the establishment who covered up many unflattering secrets of the state including that pertaining to the sinking of the USS Liberty which he never sought to redress. To his former Vietnamese foes he remains the celebrity captive, the admiral’s son immortalised as an ‘air pirate’ depicted in a statute bent on his knees next to the lake from where he was retrieved after parachuting from his downed aircraft. To white nationalists he is a ‘race traitor’ who supported successive amnesties for illegal immigrants and to the anti-war segment of the political left, he does not deserve praise for participating in a colonial war of aggression against the Vietnamese people, while the isolationist segment of the political right decried his persistent support for foreign wars of intervention. John McCain was not a straightforward hero. Nor was he an exceptional politician. The unbridled facts of his life and career in the military and as a public figure embody much of what is dysfunctional about the American republic. To succumb to the blatant myth-making and obfuscation of his life represents a failure of the nation to properly reflect and critically examine itself. That cannot bode well for the future.